As Canada’s population ages and more people are diagnosed with Alzheimer’s disease or another form of dementia, hospitals are seeing a growing number of acute care visits by people with dementia. The reason for their stay may not directly relate to their dementia. For example, they may have heart disease, they may have broken bones after a fall or they are feeling depressed. However, a stay in the hospital can be a stressful if not frightening experience for anyone, and dementia can compound those feelings further. That’s why it’s so important that people living with dementia receive support from friends and family during their stay. Seeing a familiar face or hearing the reassuring voice of a friend can give that sense of safety and comfort that can make a hospital stay easier. But what happens if that family member or friend are unable to visit in person? This is where my research comes in. By using new and accessible technology such as iPads, we can improve the safety and quality of dementia care in a hospital setting. Participating in this study are people with dementia currently staying in a hospital ward, as well as a family member for each person. Since the family knows the person best, I ask the family member to record on video a short message that would reassure the person that they are safe and being helped. Then, using an iPad, the hospital care professionals play this message for the person before proceeding to care activities. By hearing and seeing their family, the person will feel more at ease, allowing hospital staff to better assist with care (for example, help with taking medications). By showing this one-minute video to people with dementia staying in the hospital, we have a practical way to enact person-centred care. This is why I call my project Innovating together: WORKing with technologies in dementia, or IT WORKs. 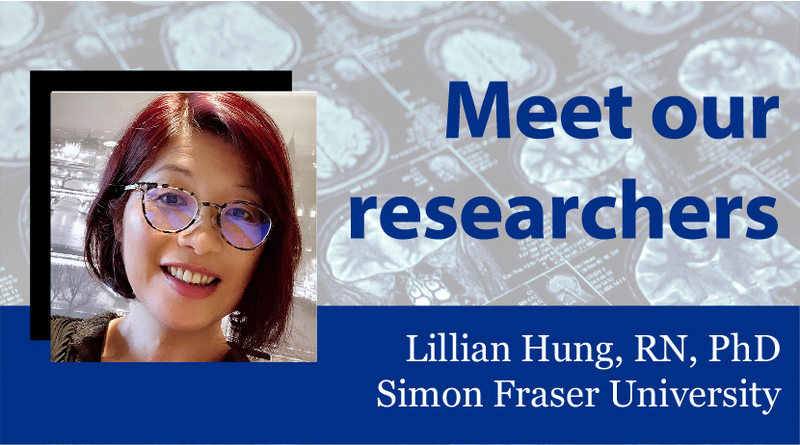 Lillian Hung, Postdoctoral Fellow in the Department of Gerontology at Simon Fraser University, talks about her research integrating technology with person-centered care. Dr. Hung is a 2018 recipient of the Alzheimer Society Research Program, receiving a $83,000 postdoctoral grant for Quality of Life research. It’s absolutely vital that we find new and innovative ways to support dementia care. Previous research and practice guidelines recommend non-drug methods, but do not specifically explain how to successfully carry out these methods. Once I’ve completed my study, we’ll have useful evidence that can support more dementia-friendly practices in hospitals. We can then create a user-friendly toolkit that can be used to help others take care of people with dementia. Everyone knows someone who is affected by dementia, and we all have neighbours, friends or relatives who may have dementia or have been affected by this disease. Thankfully, more support from donors makes research like mine possible and spreads evidence-based knowledge to families, patients and professionals.